Does Maptitude Include Premium Demographic Data? Yes! The latest demographics are included free with Maptitude 2017 only. Each annual release of Maptitude includes new data, and Maptitude 2017 includes age by income for the first time. Don't have Maptitude 2017? Purchase or upgrade to Maptitude 2017 to use this premium data. "So we needed a product that would allow us to map where our customers are located and be able to analyze demographics. Overall, considering this is a one time buy and not a SaaS, it has excellent value. The ability to overlay your data with demographic information is awesome." 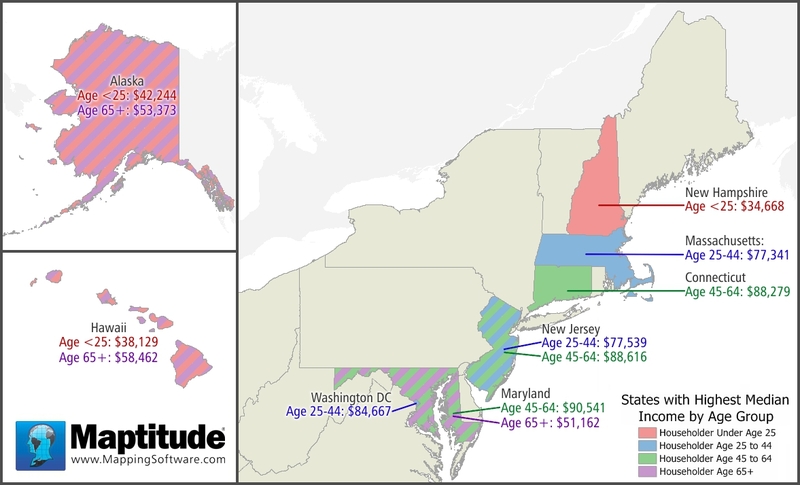 So the highest median incomes for all age groups lie in the Northeast corridor, Alaska, or Hawaii. 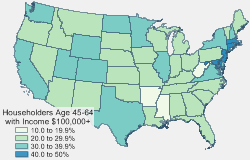 Alaska and Hawaii have the highest median incomes for both the oldest and the youngest people. These higher median incomes may be tied to the fact that the most expensive areas to live in are Hawaii, Alaska, the West Coast, and the Northeast. 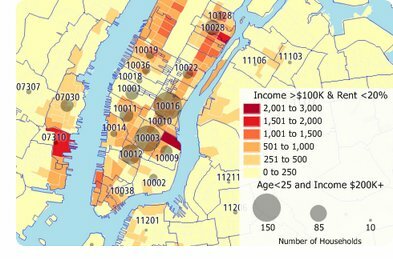 How Do I Map the "Age of Householder by Household Income" Data Included with Maptitude 2017? Maptitude 2017 includes 68 fields of data on age of householder by household income. The householder income data is accessible on most of the boundary layers included with Maptitude 2017. In this tech tip we describe how to create thematic maps using this data. For the layer that you are interested in, right click on it in the Display Manager (e.g., right-click on State) and choose New Dataview. Hover your mouse cursor over any of the field/column names. For example, hover over HH_Income $10K-14,999 to see $10,000 to $14,999|Estimate|Universe: Total households. Right-click on a layer dataview (e.g. the State dataview) and choose Structure to see a new table with descriptions of every field for that layer. Close the Structure dataview when you are done. In a layer dataview (e.g. the State dataview) click on a field/column name to highlight the data that you are interested in and choose Map > Thematic Mapping > Color to create a new map. If you highlighted several fields/columns then you can choose Map > Thematic Mapping > Chart. Copyright ©2017, Caliper Corporation. All Rights Reserved.